For people with depression, relief may come, in part, from maintaining proper nutrition, according to a growing body of research indicating that lack of certain vitamins and mineral in one’s diet may exacerbate symptoms of depression. “It’s probably at least 90 percent of it,” said Jennifer Durward, a psychiatric nurse practitioner at Northern Montana Health Care in Havre, when asked how big a role nutrition plays in good mental health. So how does it work? Chemicals used by the brain to regular mood, specifically serotonin, dopamine, norepinephrine and Gamma-aminobutyric acid, are manufactured by the body with vitamins and minerals in the food we eat. Don’t get the vitamins and minerals, you won’t make those chemicals, referred to as neurotransmitters. Folate, for example, is used by the body in the synthesis of serotonin, dopamine and norepinephrine. A 2009 article in the Journal of Clinical Psychology found that patients who took folate supplementation along with antidepressants had greater relief in symptoms than those who took antidepressants with a placebo. Serotonin is the neurotransmitter targeted by many antidepressants, particularly selective serotonin reuptake inhibitors, including common drugs such as Prozac, Lexapro, Zoloft and others. But, Dailey says, it’s important to remember that SSRIs do not help your body manufacture more serotonin. Rather, SSRIs keep more serotonin present in the brain and available for use by cells. The only way the body can manufacture serotonin is to have the minerals to do so, she said. “It’s important to understand this very direct connection between what we’re eating, how our brain is functioning and how we’re feeling,” Dailey said. Along with folate, tryptophan is important in serotonin synthesis. Sources of folate include fortified breakfast cereals, asparagus, white rice and beef liver. Sources of tryptophan include soybeans, cheddar cheese and meats such as cod, pork and turkey. Those aren’t the only minerals and amino acids the body and brain need, however. Durward recommends better nutrition as part of a multipronged strategy to improve mental health. That strategy also includes taking an antidepressant, therapy and exercising. Lacking essentials minerals, such as magnesium, and having too much of others, such as copper, may cause problems, said Durward. “Our bodies are trying to tell us something. Our brains are starving,” Durward said. Durward is quick to point out that good nutrition should not be substituted for taking antidepressants. Some people, with proper treatment that includes nutrition, may keep their dose of an antidepressant down. Dailey’s book presents an abundance of research and lists of vitamins, amino acids and minerals, what they do, and what foods the minerals are present in. The book also includes many recipes that have detailed lists of nutritional content. For some, learning to shop for nutritious foods can be a challenge, and high prices of fresh food can put a strain in budgets. But Dailey insists eating healthy doesn’t have to break the bank. 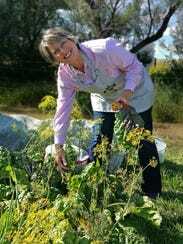 She encourages her patients to grow as much as they can in their own gardens and points out gardening can be therapeutic for some patients. But not all nutritious food is expensive, she pointed out. Dark, green, leafy vegetables are high in many essential vitamins, and a bunch of collard greens can be purchased for around a dollar. Dailey says that while antidepressants work for many and “if it ain’t broke, don’t fix it,” for some people, antidepressants do not work or cause significant side effects. For those people, changing their eating habits may help symptoms of depression. “Even if you’re taking an antidepressant, this is still an avenue to explore,” Dailey said. Ultimately, that the connection between nutrition and mental health has been slow to catch on may have its roots in cultural perceptions of the brain and the body. Showing that the brain and the rest of the body are intimately connected was one of Dailey’s goals in writing her book. Finding the root cause of the nutritional imbalance then filling the gap is key. Sometimes those imbalances also manifest themselves in gastrointestinal symptoms such as heartburn of bloating, Durward said. Dailey’s book is available at The Mountain Front Market in Choteau and online here on Amazon. What Predators Look for When You Post Pics of Your Kids Online.